Jenny’s program gave me two incredible gifts. 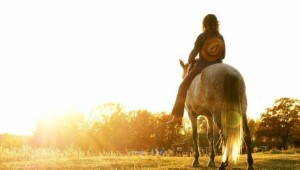 First, the lesson that pursuing joy, happiness, lightness, and comfort with horses at all times is good and is beautiful. 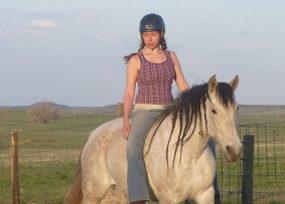 So often we’re told to push through, to fight it out, that frustration and fear are normal with horses, and I didn’t want to live like that—that was not the horsemanship I longed for. 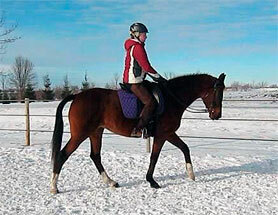 – Hannah Rivard & her horse Maia Click here for the rest of that testimonial. Heads up folks – when the new website goes up next week – the price goes up to $650 and ONLY in this last week, INCLUDED in the Fast Track program, you get three free sessions with me – to use for whatever you want – AT THE OLD PRICE. And here’s an extra special deal – if you need the weekly or monthly payment, when you’ve finished paying it off, you can also have those free sessions. Wowww… I can’t believe I just did that! When this website disappears next week, this offer disappears with it. The gift horses bring us. The Fast Track journey to a happy, confident, willingly cooperative horse is going to bring you the keys for something very special in the rest of your life too. 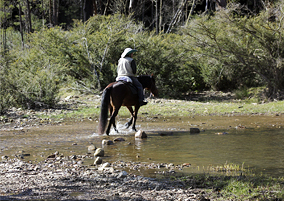 The same keys to success with your horse, are the keys to a happy life. 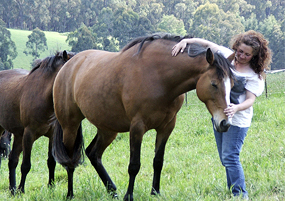 The same keys for effective gentleness in problem solving with your horse, will be the same keys to understanding and supporting the people you love or work with. Solving your horse’s anxiety issues will give you the keys to solve yours and blossom both of you into a deep sense of comfort and confidence. I so enjoy watching all the different ways that the horse gifts flow into the rest of everyone’s lives. So much of what I see as generally accepted out in the world is not OUR version of normal at all. Normal in our world is what you see with Sunny pictured here. She had been incredibly dangerous with her feet. The techniques that you’ll learn are what we used to bring her to this comfort and willingness. 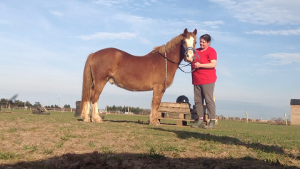 Our other NORMALs includes a happy, confident horse who wants to be with you, who comes with you willingly away from other horses, enjoys having you on their back, carries you with strength and ease, is soft and responsive, who looks to you when something goes wrong. Normal is a horse who is happily polite at feed time and keeps their eye out for you, to keep you safe too. Normal is a horse that is curious and happy to learn. All of these things ARE NORMAL and completely achievable with effective gentleness. 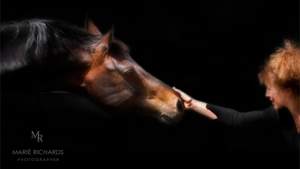 All of those lovely behaviors are simply reflections of a solid horse and person connection, clear communication and confidence together and if that’s not what we’ve got, then it’s a sign that we … WE… need to do something differently about it. This photo of Sunny again is a prime example. Minutes later she self loaded at liberty. In the past, she had been so terrified of a float that just seeing the roof of the float appearing over the hill had her rearing and plunging in terror. Fast Track is much more than just beautiful words and spiritual principles – it’s a PRACTICAL, step by step pathway to bring beautiful concepts into reality and you won’t find anything like it – or results anything like it – anywhere else in the world. There’s so much we can talk to you about this wonderful program and all its support systems, you could be here all day – so just read more on the sections that interest you. Is it really a Fast Track? 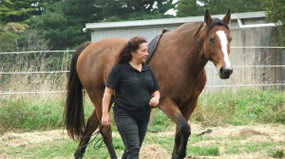 ♦ More than 8o lessons – a mix of interactive audio and video lessons for the wonderful magnetic riding seat that I keep raving about and lessons to help you to help your horse become that happy co-operative partner. You’ll get the links to the lessons in your Inbox once or twice a week. You’ll also get access to the entire Fast Track program once you have enrolled so that you can work faster at your own pace, if that’s your preference. ♦ A monthly Live Seminar (10 per year “God willing and the creek don’t rise” as my Texan friend says). There’s an invaluable archive of these going back years – a treasure house of lessons and live discussion, an opportunity for questions and success stories that personalize the course – a wonderful opportunity to hang out with like minded people. 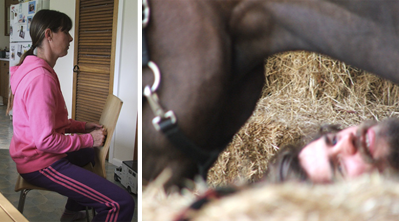 I often do short sessions of working with people one on one in a live seminar – it’s part of my absolute commitment to make sure that everyone on fast Track develops their Feel with their horse. You can join in as often and for as long as you like, live or recorded – it’s totally up to you, there are no restrictions. There are people who are still joining in for the cameraderie years later and we constantly develop new information, add lessons and find different ways to explain things. ♦ A private Student Forum – So you can share your journey and experiences with our lovely community of like minded people. This is an incredible resource. There’s a whole section with questions and answers on individual Fast Track lessons. As at March 2019 there were also 34 Extra Lessons from Jenny on a vast number of topics and problems. ♦ A Lifetime Support System – The support is phenomenal. I don’t know anyone anywhere, that gives this much support for an on line program and you get access to that support, to the Live Seminars and the Student Forum, for as long as you need or want to. ♦ Access to live teaching – includes the opportunity for one on one sessions available with me or our seriously wonderful other staff. Lots of you will have a FREE private lesson with me that comes as a bonus with your Fast Track purchase. ♦ My “Love this program or get your money back” Guarantee. ♦ Private lesson with Jenny – to be used whenever suits you, no time limit. People have told me that this lesson is pure gold. Some people use it straight away to get more confidence with their Feel, others save it to use for when a problem crops up. Technology makes video lessons so easy these days. ♦ Oliver’s Diary – We’re eight lessons into this lesson set, with more to be released from time to time as my workload permits. You’ll read about and sometimes watch live footage of what turned Oliver from a dangerous horse with “a screw loose” into my giant teddy bear. Enrolment Options: weekly, or monthly OR a whopping discount for payment up front. If you’re ready for this lovely journey, then there’s an enrollment option to suit everyone. If you’re ready to step into Fast Track, then there’s an enrollment option to suit everyone. Jenny is passionate about this extraordinary program being accessible to EVERYONE who wants to join the Fast Track so she has created a weekly payment option of only $12.69 a week for 52 weeks – and get your lessons into your Inbox, once and twice per week for a year. This option has the same lifetime support system as any other payment method. You can get Fast Track to Brilliant Riding for $54.99 per month for 12 months and get your lessons into your Inbox, once and twice per week for a year. This option also has lifetime support with the forum, questions and answers and monthly live seminars. 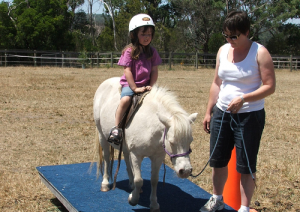 You can get this horse and life changing Fast Track to Brilliant Riding, for one, upfront payment of $550 and get your lessons into your Inbox, once and twice per week for a year. Please note that this option DOES include the Fast Track Bonuses of a Private Lesson with Jenny (valued at $180) plus Oliver’s Diary (not priced yet but around $125), plus the savings of $109.88 – that’s over $400 of savings and extra value for the upfront payment.